I am attempting to temporarily disable/quit out of Start10. I followed the procedures outlined in the following forum post: https://forums.stardock.com/437032/page/1/#3589092 (both the command line and Startweak methods) However, Start10 always reactivates itself as soon as I click on the start menu icon. Is the ability to unload Start10 currently broken? 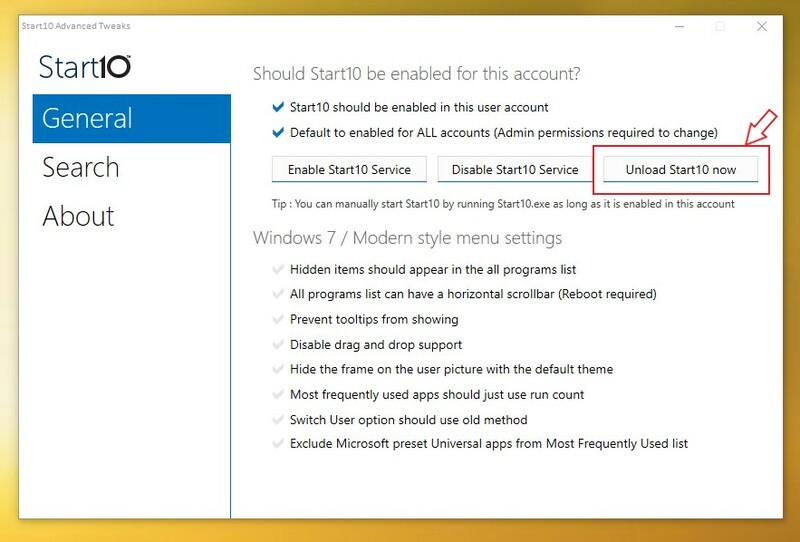 If not, what is the correct method for disabling Start10 until manually restarted/loaded or a reboot? this does not work for you ? That is correct. That is the same post I referenced as the source for the methods I attempted. You can to run the Start10tweak.exe. Located usually at C:\Program Files(x86)\Stardock\Start10\ and click the "Unload Start10 now" button. Just that on my system I have Windowblinds. Doing Unload Start10 will somehow effect Windowblinds too. If you have Windowblinds its best to disable Windowblinds first. BTW, rereading your first post. It restart again? Make sure to reinstall using the latest by download it again from your account. Reboot and test it again. Report back.